Leti was awarded the Carnot label 10 years ago for the quality and professionalism of its research activities in partnership with socio-economic actors.  In France, the network of Carnot Institutes plays a pivotal role in aligning public research and industry. It comprises 19,000 researchers and accounts for 55% of the R&D work that businesses entrust to French public research institutions. Leti's status as a Carnot Institute is also key to its resourcing. This allows Leti to launch exploratory research projects in groundbreaking new areas and evaluate the latest ideas. It also makes it possible to implement strategies for collaboration, both within the network and internationally, in the form of research chairs, scholarships, or projects, resulting in the creation of technology demonstrators and integration of functions based on the most promising subjects. As such, Leti develops new technological solutions and offers built around a marketing plan.